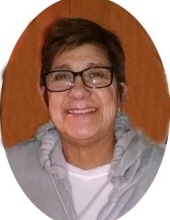 Kathy Lynn Turk Payne, age 60, of Brodhead, KY; passed away Friday, November 23rd, 2018 at the U.K. Heath Care Center in Lexington, KY.
She was born on February 17th, 1958, in Hazard, KY; a daughter of Charlotte Ann Neyens Turk and the late Thomas Garland Turk. She was of the Catholic faith. She found great joy in spending time with her grandchildren, reading, flowers, gardening, cooking, and antiques. Those left to celebrate her life are: her Children: Courtney Payne (Rose) of Brodhead, KY; Heath Payne (Tammy) of Mt. Vernon, KY; five grandchildren: Halek Payne, Kovey Payne, Sadee Payne, Blake Mullins and Mason Payne; Her mother: Charolette Ann Turk; three siblings; Bess Combs, Lee Williams and Stephanie Turk. As well as a host of nieces, nephews, friends and neighbors. In addition to her father, she was preceded in death by her brother: Tom Turk. Visitation for Kathy Payne will be Monday, November 26th, 2018 from 4:30 P.M. – 6:30 P.M. at Marvin E. Owens Home for Funerals Brodhead, KY. Funeral services will be conducted Monday, November 26th, 2018 at 6:30 P.M. at the Marvin E. Owens Home for Funerals Chapel Brodhead, KY with Bro. Shannon Franklin, officiating. To send flowers or a remembrance gift to the family of Kathy Lynn "Turk" Payne, please visit our Tribute Store. "Email Address" would like to share the life celebration of Kathy Lynn "Turk" Payne. Click on the "link" to go to share a favorite memory or leave a condolence message for the family.